We organized a library project in Manisa Soma Ayşe Temizel Secondary School between June 2017 and February 2018 with the Mavi Pusula Education and Aid Association (MAPUDER). The project was the 11th of MAPUDER’s Blue Libraries project, which was established in 2013, with the college students meeting under the roof of an association in order to meet the basic needs of the schools. In the end of 2016, MAPUDER stated that past libraries were designed by their architect members and that they wanted to produce the next library in a different way with the participation of us and the students. After the decision was made at Ayşe Temizel Secondary School, we had a discovery trip to the school on June 19th, 2017 for the first time. We interviewed the school principal and the teachers and we took the survey of the place which was allocated for the library. You can read from our blog about the discovery tour. After an open call, we realized the design workshop with 6 architects and interior architecture students on 24-28 July 2017. 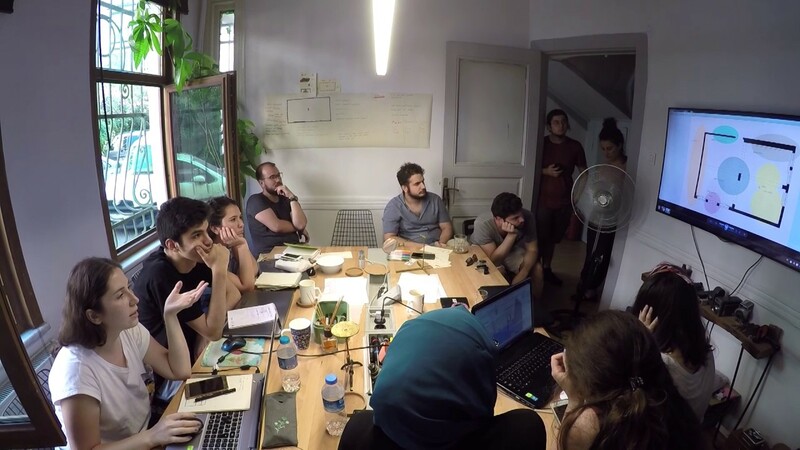 The workshop in the Super Eight architecture office in Istanbul was the first example of how to work in an architectural office where we have just begun to get logistical and cognitive/conceptual support. We worked on the design of the library and details of the equipment to be installed inside it, which was produced by combining an old classroom and a section from the school corridor. As a result of the workshop, there will be a platform around the column in the middle of the volume that will allow free use and can also be used as a library, library units with table and seating usage on the 3 wall surfaces, interactive panels, tables and chairs that can be used in different forms in the section where the intelligent board is located, cushions that could get into the gaps were suggested. During the course of the workshop, where a jury was held with the participation of members of the association and Super Eight employees and trainees, ideas from the workshop were elaborated and made into a booklet in the following week. You can review the design book from this link. Following the design work, MAPUDER undertook the furniture manufacturing process and the materials and colors of bookcase units, flooring, tables and chairs were changed due to financial impossibilities. Due to these changes, a new proposal for wall colors was made. After the completion of the furniture production and preliminary preparations in the place, the application workshop took place on 10-11 February 2018. In the workshop students from the design workshop, our members who were visiting the Yırca Sabunevi project in Soma, MAPUDER members and volunteers have participated and application and installation works were carried out. On Monday, February 12, the library begin to function with an opening event with the participation of school students. We would like to thank the Mavi Pusula Education and Aid Association, our cooperative partner in the process, the Super Eight Architecture office, which warmly welcomed us at the design workshop, and all participants and volunteers. You can read the interview we gave at the end of the project here.